The Delhi Finance Minister, Dr A. K. Walia, today proposed an estimated budget of Rs 13,345 crore for 2006-2007, with an indication of 12.6 per cent growth as compared to 12.3 per cent at the national level. The budget includes Rs 5,200 crore as plan outlay, Rs 8,078 crore for non-plan expenditure and Rs 70 crore for centrally-sponsored schemes. 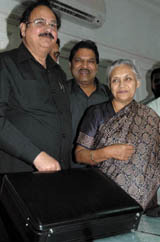 Chief Minister Sheila Dikshit and Finance Minister Dr. A.K.Walia before the budget presentation. The present state government and its machinery has spent quite a healthy sum on funds, time and effort on publicising its achievements in the first year of its coming into power. Several queries relating to the capital were taken up in Parliament today. The Union Minister of State for Urban Development, Mr Ajay Maken, told the Rajya Sabha that several types of alterations reported in DDA flats can be regularised under existing building regulations. Regularisation of such changes can be ordered in accordance with laid down procedures involving requests from flat owners. Here comes the big chance for the true-blue married Indian woman to show the world what she is like — a dynamic personality endowed with beauty, grace, strength and family values. So, if you’ve got a body that you are proud of and juggle your time with kids and work with great efficacy, make sure you turn up for the audition for the Mrs India-World contest this Sunday. For all you know, you may end up representing the country at the international pageant, Mrs World, to be held on April 23 at St Petersburg, Russia, rubbing shoulders with contestants from more than 50 countries. The official website of Noida police, www noidapolice.com, has been launched. Formally launching the police website, Samajwadi Party MP Amar Singh said this was another significant step toward hi-tech policing in the area. The website would enable the common citizen to lodge a complaint without having to visit the police station, Mr Amar Singh added. The Commissioner, Gurgaon Division, Dr Avtar Singh, organised a meeting of officials from Gurgaon, Jhajjar and Sonepat districts to strengthen the canal water system and check incidents of theft to meet the water requirement for the summer. The Additional District and Sessions Judge, Mr Alok Kumar Trivedi, has sentenced five persons accused in a murder case to life imprisonment and fined them Rs 5,000 each. A day after the Capital experienced a sudden burst of hailstorm and rain, a thick cloud cover enveloped the Delhi skyline again, indicating another spell of rainfall. The rainfall yesterday, accompanied by hailstorms, was followed by a coolness in the Delhi air, with maximum temperature witnessing a sharp drop to 29.7 degree Celsius, from a high of 34 degree Celsius yesterday. Delhi Police has chargesheeted the office bearers of a Co-operative Group Housing Society (CGHS) in east Delhi for cheating the members by not paying electricity bills to erstwhile Delhi Vidyut Board but charging full payments from the members. A man accused of having killed his wife and daughter has surrendered in the CJM’s court in Phase-II here. The police from the Sector 20 police station rushed to the court on learning about Islam’s surrender yesterday. A women died here after a heavy dose of pesticide was forced down her throat allegedly by her in-laws for not meeting their dowry demands, police said today. The share of tertiary sector in Delhi’s economy, which was 77 per cent at the terminal year of 9th five-year plan, has increased to 79 per cent during the third year of 10th five-year plan. Such increases in the share of services sector is due to impressive growth in trade, transport, communication, real estate, banking etc. While presenting the budget proposals, the Finance Minister said the per capita income in Delhi had become more than double. In 2004-2005, it was estimated at Rs 53,976 per annum as compared to Rs 23,241 at the national level. The Planning Commission has approved a plan outlay of Rs 520 crore for the annual plan 2006-2007, which is 11 per cent higher than current years revised plan outlay. The power sector accounts for more than 20 per cent of the total plan expenditure. The government has also decided to raise the old age pension financial assistance from Rs 350 per month to Rs 400 per month with effect from April 2006. An amount of Rs 28 crore has been allocated for schemes to provide textbooks and uniforms to all government and government aided schools. To develop the rural villages of Delhi, an outlay of Rs 106.75 crore has been proposed for the year 2006-2007. Besides, the government has also proposed health schemes with an outlay of 13.29 per cent of the total estimated budget. In order to reduce the household expenditure, rate of tax on LPG has been reduced to 4 per cent. Dr Walia also proposed that the composition of tax be reduced to 3 per cent in the case of goods procured from outside Delhi and where no statutory forms under Central Sales Tax Act are used. In the case of goods procured from within Delhi, the composition tax has been reduced to 2.5 per cent. The government has also given relief to chemists dealing in drugs and medicines with a turnover of less than Rs 1 crore. They have to pay a composition tax at the rate of 1 per cent of the total turnover. A rebate of four per cent has also been given on ‘desi ghee’. All ‘hawan samagri’, blood components and aids and implements used by handicapped persons have been exempted from tax. The rate on bullion has been reduced from 1 per cent to 0.1 per cent to prevent shifting of precious metals trade to neighbouring states. “It is a pro-women, pro-poor, pro-underprivileged budget,” Walia later told reporters. He also said the budget has enhanced allocation in the major sectors of transport, urban development, public health, technical education, sports, art and culture and social welfare. The residents here, on the other hand, have been suffering as a result of the ongoing power crisis and alleged discrimination in the supply of available power. A major part of the town went without power supply for 10 to 14 hours yesterday, throwing life out of gear. Though the Chief Minister, Mr Bhupinder Singh Hooda, has admitted that the short supply of power in the state is a major issue, the department handling power generation and supply has also been unable to maintain a proper balance between cuts and supply. According to sources, the district, which requires about 80 MW of supply daily, has been getting around 60 MW these days despite the fact that various power plants here have been producing about 600 MW of power daily. Reportedly, the poorly maintained plants have led to hurdles in realising their total potential. The fairly regular snags have also been affecting the overall supply. Officials of the Dakshin Haryana Bijli Vitran Nigam (DHBVN) have also been allegedly adopting discriminatory measures towards the overall supply here. There have been a large number of power cuts during the day in Sectors 3, 7, 8, 9, 10, 11, 12, 14, 15 and 17 ranging from five to eight hours, but there was hardly any cut or disruption in power supply in Sectors 15-A and 16-A yesterday. While there has been a hue and cry over the poor supply for the past about two months from a majority of the sectors and colonies in the city, certain residents of Sector 16-A claim the power supply in their area has been near normal during this period. The supply in this area has been from a particular feeder, which is responsible for supplying power to the so-called VIP area consisting of Officers Colony, where the senior district officials of the government reside. Moreover, the Circuit House, where most of the VIPs prefer to stay during the visit here, is also located in the same area. Besides, it boasts of having the houses of many serving and retired officials. One of the major problems being faced by residents here is that they do not know whom to contact during the power cuts and unannounced load shedding because the Bijli Suvidha Kendra, which has been outsourced to a private company by the DHBVN, fails to respond to their queries. According to a local resident, the phone at this centre either remains busy or the person handling the phone does not have any information about the power cut. Senior officials of the department, including the Superintending Engineer and the Executive Engineers, were not available for comments when this correspondent tried contacting them during the cut yesterday. The DDA has found roofing of courtyards as one of the most common alterations in its flats, the Minister said in a reply. Building a room on roofs, maybe because of family requirements, is also a common form of alteration in DDA flats, he added. The Centre aims at developing e-governance solutions for municipalities across 423 cities and towns with a million-plus population by 2011, Mr Maken said in another reply. The national mission mode project on e-governance in municipalities will assist in improved service delivery, decentralisation, better information management and transparency, he said. Replying to another question, Mr Maken said the DDA is expected to allot 9,734 new flats under the lower income group (LIG) category. The DDA has allotted a total 299,690 flats of different categories from 1981 to February 2006, he added. The Minister of State for Railways, Mr R Velu told Rajya Sabha that the railways had taken several steps to reduce pressure on the three major railway stations in Delhi, including extension of platform at Safdarjung and building of a new terminal at Anand Vihar. Mr Velu said in a written reply that these measures were initiated besides expansion and renovation works at the three major railway stations — Delhi (old), New Delhi and Hazrat Nizamuddin..
At the Safdarjung (Delhi) Railway Station, work was in progress for conversion of line one into common loop and extension of platform at a cost of Rs 2.28 crore, he said. There is a provision of a new terminal at a cost of Rs 85 crore at Anand Vihar. The Minister also said that the Delhi-Sarai Rohilla station is also being used for dispatching and receiving special trains for clearing holiday and summer rush. The Minister of State for Home, S Regupathy, said of the five incidents of blasts in the Capital last year, investigations into three cases — May 22 blasts in Liberty and Satyam cinema halls and October 29 Sarojini Nagar blast— have been completed and chargesheet filed against eleven people. Of these, eight have been chargesheeted in the May 22 blast case and three for the October 29 blasts, he said. One accused in connection with the serial blasts was killed in an encounter on January 16 this year, the Minister added. In response to another query, the Minister said that 345 were crushed to death last year by the ‘notorious’ public transport buses of Delhi. This number was slightly lower than the figure of 351 killed in 2004. Private and blueline buses, rushing madly towards passengers and money, were the main culprits once again, killing 217 people in 2005, slightly less than the 246 killed a year back. Lawlessness on the road by mini bus drivers doubled over the year. As against 29 killed in 2004, mini buses took 57 lives in 2005. According to figures given by Mr Regupathy in the Rajya Sabha, 35 people have been killed and 121 injured by public transport buses till February 15 this year. The number of persons injured by buses in Delhi in 2005 and 2004 is 1,197 and 1,275 respectively, he said in a written reply. Meanwhile, Union Tourism and Culture Minister Ms Ambika Soni told the Lok Sabha that India has made a bid for getting the ‘World Heritage Status’ for Delhi’s Red Fort. The contest will see auditions in five cities across the country, starting with Kolkata (March 9), Bangalore (March 11), Delhi and Mumbai (March 12) and Chandigarh (March 13). The venue in Delhi is Metropolitan Hotel Nikko. She is one of the judges at the event besides Noyonika Chatterjee and Delhi’s very own Manpreet Brar. The city-level auditions will comprise three rounds: catwalk, question & answer and talent round. Winners will then go to Mumbai for a seven-day grooming session beginning March 17 before appearing in the final round there on March 25. Noida SSP Piyush Mordia said the telephone numbers of all police stations, SOs, important police officials and officials in charge of police posts in the district would be available on the website. Telephone numbers of RWA officials of all sectors and gram pradhans would also be available. Information on the progress made in police verification for a passport, abandoned vehicles, unidentified bodies and missing persons would also be available at a click on the website. The details about history-sheeters would also be available on the website. A complaint and suggestion box would also be available on the website. The police would take immediate action on the complaint lodged on the website, SSP Mordia assured. Details of crime in the district would be available on the news page of the website. The website has already begin to make waves, with the inclusion of the name of Bharat Yadav, state secretary of Samajwadi Party, in the list of history-sheeters of Gautam Budh Nagar district posted on the website. Details regarding his age, address and father’s find a mention on the site at serial no. 27/A, alongwith a photograph. 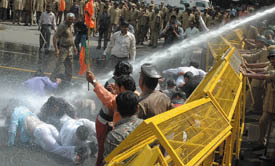 The Noida police say the Samajwadi Party leader is just one among 462 history-sheeters on the police website. The names of history-sheeters of other police stations are yet to be posted on the website, it is learnt. The website contains details about the most notorious criminals. There are in all 16 dreaded criminals in the district, who are in the category of most wanted criminals, the police said. Most of them carry rewards on their heads. This website is likely to expose a number of so-called “respectable” persons also. The details about all these criminals on the website could be had on telephone also, the police said. In keeping with the directive of the Chief Minister, Mr Bhupinder Singh Hooda, Dr Avtar Singh held the meeting of these three district officials despite the fact that Jhajjar and Sonepat districts do not come under his purview. The meeting was attended by all three Deputy Commissioners, Superintendents of Police, the Administrator, HUDA, Gurgaon, the Superintending Engineer, Irrigation Department Ses and other officials of these districts. Dr Avtar Singh directed each Deputy Commissioner to ensure patrolling on the 70-km canal route by the police party. The patrolling should be supervised on daily basis by a senior official of the rank of executive engineer or tehsildar, added the Commissioner. Dr Singh further directed the SPs to lodge an FIR immediately and take stern action if somebody was found breaching the canal and stealing the water. The canal starts from Karkoi village in Sonepat district, passes through Jhajjar villages and terminates at the Basai water treatment plant in Gurgaon. There are hundred of cases of stealing of water throughout the year in various villages of three districts. Canal breaching incidents increase during summer due to the shortage of water supply, informed an official. The Commissioner further directed the officials that closure of canal for desilting and cleaning should not be held for more than four days as the water tanks at Basai had the capacity for storing water for four days. A short time project of Rs 17 crore has already been approved for increasing the canal capacity from 100 cusecs to 130 cusecs per day by widening and deepening the canal, informed the officer. The Administrator, HUDA, Gurgaon, Mr S. P. Gupta, informed the government would ensure that there would be no shortage of water supply this summer for residents here. “As the population increases, we are also increasing our capacity”, claimed Mr Gupta. The young daughter of Om Veer Singh of Bahalolpur village had gone out in the fields to answer nature’s call at 6 am on August 19, 2000, where she was molested by Mukesh, a youth of the same village. When Om Veer and other family members went to lodge a complaint with Mukesh’s house, they were all turned away. At 7.30 am the same day, Mukesh, Sattan, Ghanshyam, Rajveer and Sushil, alias Shyam Singh, came to Om Veer’s house and started threatening him and his family. When Om Veer and the others tried to oppose them, Mukesh and his kin started firing gunshots at them. Bhagwati Singh and Charan Singh were hit by bullets. The latter succumbed to his wounds in the hospital. Weathermen said the rainfall yesterday, the first in the last nearly two months, was caused by an upper air cyclonic storm originating from areas in Rajasthan. The upper air cyclonic storm, coupled with a sudden shooting up of mercury to 34 degrees, caused a sudden build up of clouds towards the evening, resulting in hailstorms and rain, the met office said. In fact, the met office said about 3.1 mm of rainfall was recorded in the capital till this morning. And, with the cloud persisting today, weathermen predict another spell of rain or thundershowers in the next 24 hours. The minimum temperature, which was recorded at 18 degrees today, was likely to drop to 13 degree Celsius tomorrow. The coolness in the weather is a sharp relief from the scorching conditions that have characterised the weather in Delhi since the beginning of February, with the minimum and maximum temperatures hovering at around 18 degree Celsius and 32 degree Celsius respectively. A case of criminal breach of trust and misappropriation of funds, registered on a recommendation made by Y P Singh Alhuwalia, Chief Prosecutor at the Karkardooma Courts, relates to the Friends Co-operative Group Housing Society in the Patpar Ganj area of east Delhi. According to the complaint made by J L Varshney and supported by some other residents of the society, the office bearers of the CGHS allegedly took direct supply of electricity from a pole between June 14, 1994 to March 25, 1995, reportedly due to a burnt electricity meter. However, they allegedly received full payment from the members of the CGHS against the electricity consumption as sub-meters were installed in their flats, while paying nothing to the DVB. As per the complaint, the accused individually collected the money from the members but never deposited the money with the DVB and even gave 25 per cent rebate. The police are likely to ask for a remand in order to help them with the recovery of the head and torso of his wife. Islam reportedly told the court that he had murdered his wife as her character was not good. He also suspected he was not the father of their daughter. The police had recovered the severed parts of bodies of a woman and a girl from sacks in the drain in Harola near Sharma Market on February 15. The bodies were identified by a youth from Mizapur as that of his sister and niece five days after the crime. The woman was living with her second husband, Islam, in Harola. Shama Parveen, who was married to one Inam, was being harassed for dowry and on Tuesday her in-laws forcibly made her consume a heavy dose of ‘Celphos’ pesticide, Senior Superintendent of Police Rajiv Sabharwal said. He said a case had been registered against six persons, including her husband, father-in-law and mother-in-law under relevant sections of the Indian Penal Code and Anti-Dowry Act.